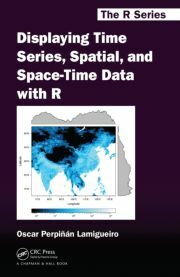 Displaying time series, spatial, and space-time data with R is available for pre-order | Omnia sunt Communia! I just ordered the book today…can hardly wait until it gets here! 70$ for the book. I guess I will have to learn all that stuff through other means. If you don’t want to pay 70$ for a hardcover full-color book but still want to learn, please visit the book website. There you will find the main graphics of the book, the datasets used in the examples as well as the full R code. Do you have plans for a paperback version? Sorry, I can’t give you an answer. That’s an editor’s decision. I suspect that they have chosen the hardback format because the book is full-color.